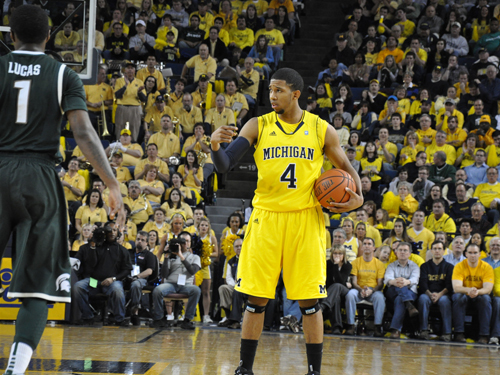 In spite of Michigan fans' wishes and scout near-consensus that Darius Morris should spend another year in college, the Wolverine's best player will be headed to the NBA draft and forgoing his final two years at Michigan. First things first: Best of luck to Morris in the NBA. It became clear about halfway through his freshman year that Morris was a special player with NBA-caliber talent. We all knew this day was coming, we just hoped it would come 365 days from now. To that end, Morris emphatically did things the right way with regard to the process. There wasn't a rift between he and Beilein (or at least one that was ever made public), and his exit was both frugal and professional. He thanked the program, spoke highly of everyone at Michigan, and exited in the fashion in keeping with his on-court persona and talent. Moreover, Morris went about this the right way insofar as retaining his eligibility and maintaining the possibility to return to Michigan. In the end, he made the decision that he thought was best for him. But was that the right decision? Honestly, I'm inclined to say yes, for a number of different reasons. The first is simple: make that money while you can. If we've learned anything in the last few years, it's that professional sports careers can crumble at the drop of a dime: a bad fall, twist of an ankle, an unfortunate car accident, etc. Morris is a player who has likely aspired to play in the NBA for most of his life and has done all the right things to assure that happens. He deserves to play in the NBA and deserves whatever spoils come his way because of it. It's smart to get in while he can, start making money, and hope that turns into a long and fruitful professional career. Don't fault him for that. But the difference in money between being a late-first-round/early-second-round selection and a lottery pick--which is where Morris is projected to go, and where scouts think he has a chance to land if he returns to Michigan, respectively--is significant, you say. Sure, but confidence that he'll find himself drafted in that range is probably enough to force his hand. The primary knock against Morris is his shooting ability. Whether or not he's able to improve his shooting over the course of the next season is speculative, and with a solid draft projection in a weak draft class, it's tough to convince anyone to return to college on the off chance that he'll rise a few spots in the draft. I'm split on what this means for Michigan in the long run though. Obviously the on-court production will suffer next year, but this may be a huge boost for recruiting. One if the knocks against Beilein, in the minds of recruits, is that he can't get them to the League. If Morris goes in the first round, that idea should be thoroughly debunked. Because the D-league Rookie of the Yearing that DeShawn Sims did and the spot minutes Manny Harris saw for the woeful Cavaliers does little to dissuade recruits of this notion. Then again, recruits want success at the college level as much as they want to get to the pros, and if Morris' exit does as much harm as it potentially could, recruits won't even both giving Michigan a look. Regardless, best of luck to Darius in the draft and the NBA. He's a player whose progress I'll be following intently.